Croatian food is as complex and varied as the many cultures that have influenced its evolution. Easily recognizable Italian, Middle Eastern and Ottoman influences intermingle with Croatia’s Balkan staples. 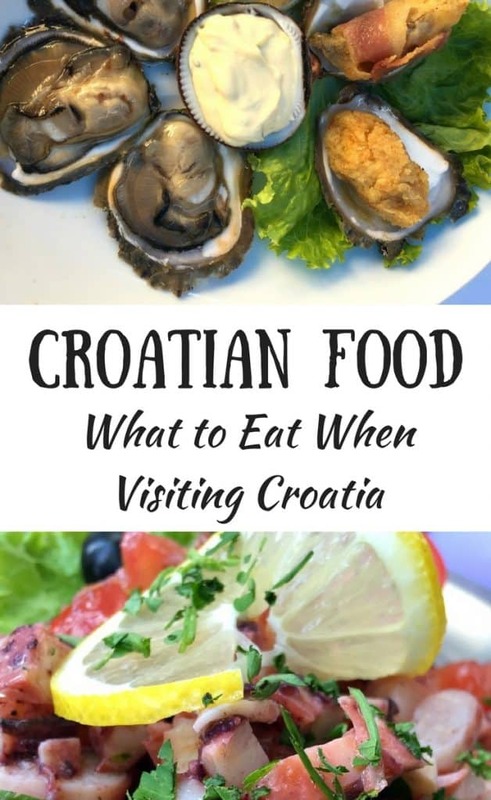 Several distinct regions in Croatia reflect their own influences on the cuisines. The county’s long coastline gives it access to a wide range of seafood, making fish and shellfish very popular ingredients. Fresh seasonal and local vegetables and dishes of meat, including pork, lamb, and beef are all popular on Croatian menus. All of these elements result in a huge number of distinctly Croatian dishes. 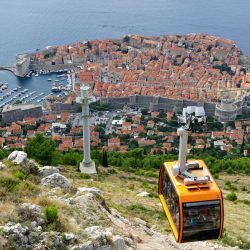 We’ve gathered the best in Croatian food and drink that you must try on a visit to this unique country. 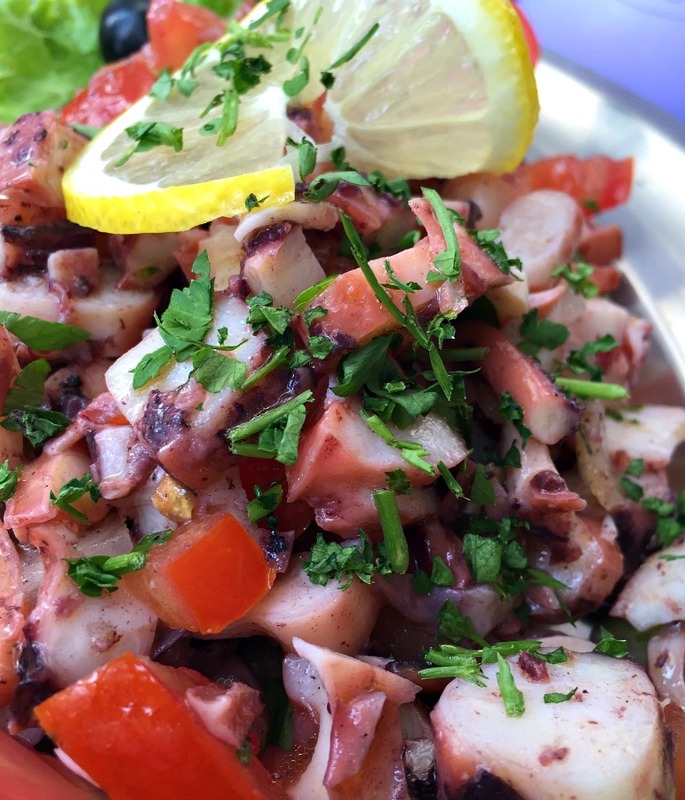 Octopus salad can be found on all the traditional menus on restaurants around the Dalmatian coast. Restaurants vary some ingredients in the recipe, but the simple version is comprised of octopus, onion, tomato, olive oil, and some lemon juice.The octopus should be tender, not chewy. 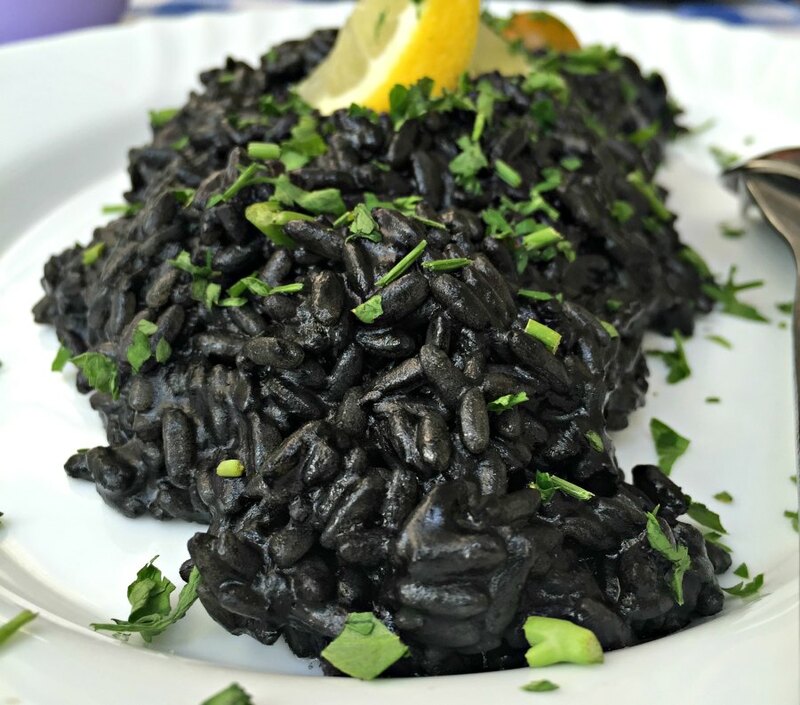 This dark (actually, black) rice dish is colored with cuttlefish ink. But, don’t worry about an “inky” flavor – only enough ink is used to color the rice. The resulting flavor is unique, buttery, and delicious, and isn’t overwhelmed by the ink flavor. Chunks of cuttlefish (similar to squid) mix with the short grain rice, and the dish is tender and flavorful. Try this at Konoba Duboka Ladovina, a favorite with locals as well as tourists. Really just traditional seafood risotto, restaurants describe this risotto as “white” to differentiate it from a similar version that mixes tomatoes into the dish. It’s also distinctly different fmo black cuttlefish risotto. The seafood used varies with whatever is fresh, but you’ll typically find shrimp, mussels, clams, squid or cuttlefish, and even chunks of fresh fish. This risotto is cooked with garlic and white wine, and lots of butter, and is basically identical to Italian risotto. Croatia has a long history of producing olive oil and it is used extensively in their cooking. The oldest living olive tree is said to be 1600 years old, planted by the Romans. 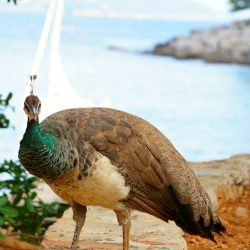 It sits on the Island of Brijuni and actually continues to bear fruit. Pasticada is a special occasion meal, often served at Christmas or at weddings, and the preparation is involved. Made with top round or rump steak, the meat is first pierced with a knife and stuffed with garlic, cloves, and/or bacon. The meat is then marinated in vinegar overnight. The marinated beef is placed in a pan with onions, parsley root, more bacon, nutmeg and prunes, and enough water and Prošek (Dalmation sweet dessert wine) is added to cover everything. It’s then roasted for about five hours. Once the meat is done, the vegetables are blended into a sauce, which is served spooned over gnocchi or other pasta. The combination of the vinegar and the prunes results in a surprisingly subtle sweet and sour flavor. The slow cooked meat, when done correctly, can be cut with a spoon. The gnocchi pasta, a potato-based pasta that should be light and fluffy, complements the meat. And of course, gnocchi is the perfect way to sop up every bit of the delicious sauce. Just like most places on the sea, you’ll find plenty of mussel dishes here. 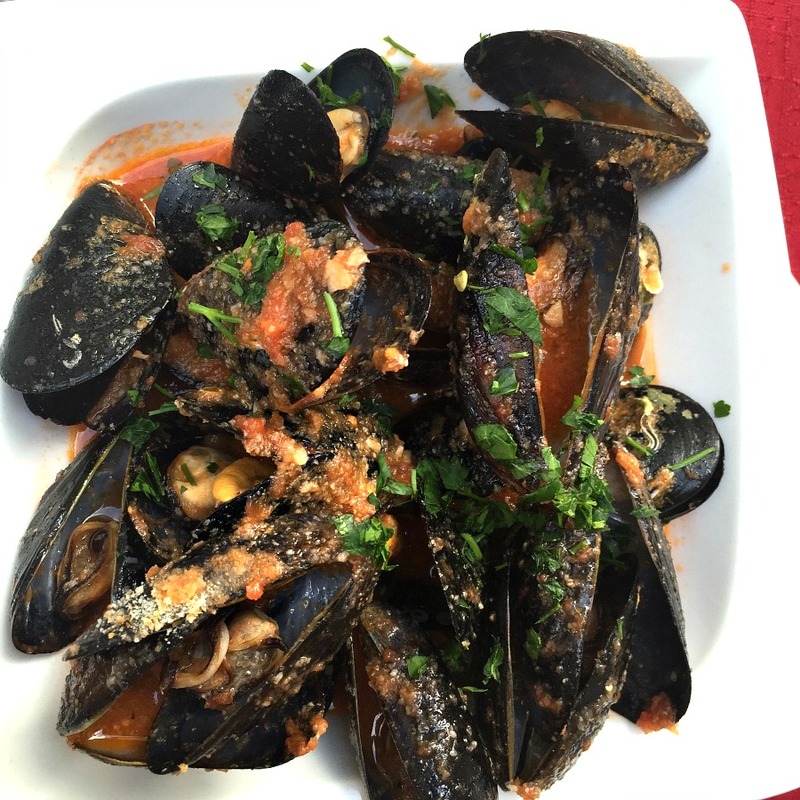 Our favorite is mussels cooked with garlic, wine, and some tomato. A crust of bread will mop up the delicious sauce – order a basket. The town of Ston, not far from Dubrovnik Croatia, is renown for its oysters. On a visit to Ston, you’ll see the sea outside of the old town cordoned off into grids. These are the farms where the precious bivalves are carefully grown. 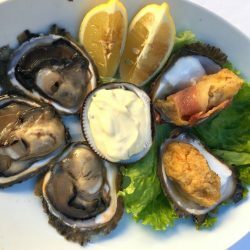 You can get oysters individually, by the dozen, or even wrapped in smoky prosciutto and fried. But if you head to a local morning fish market, find the lady selling oysters – she’ll shuck one for you while you wait, squeeze a bit of lemon on the fresh, raw meat, and hand them over to you. You’ll be getting a taste of the sea! 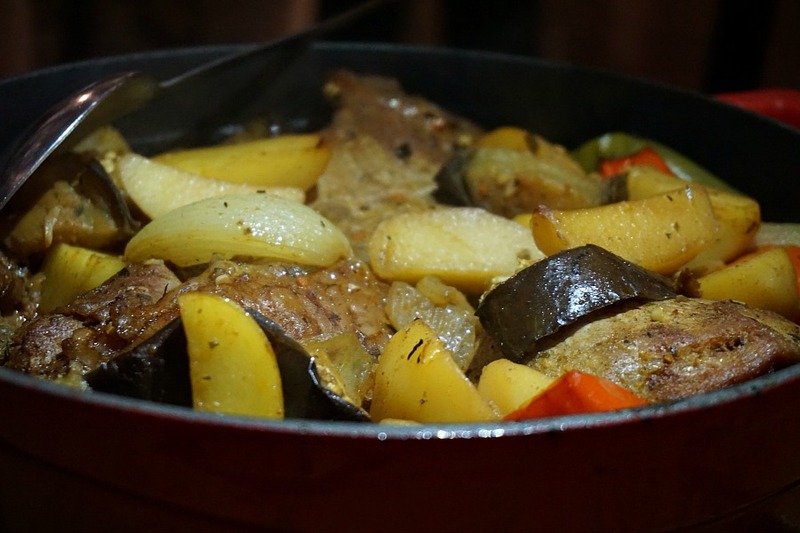 Slow cook veal or octopus with potatoes and other vegetables, under a “bell” or pot covered with coals, and you’ll end up with Peka . This dish was traditionally a working person’s meal, which was slow cooked while the a farmer was out working in the fields, and would ready once they returned home to eat. These days, it’s become a bit of a high end item, with restaurants asking you to order it in advance because of the cooking time required. If you have the time (and money), make the reservation and enjoy the experience of the waiter revealing your very own Peka at your table. Are you ready for some street food? Ćevapi (or ćevapčići), small sausages made from pork and beef, are the ultimate Croatian street food. Most stands on the street (look by the bus stops)offer them. The sausages are grilled, and then stuffed into a pita-like bread, with red pepper and tomato sauce (ajar), sour cheese, and onions. These sandwiches are the ultimate hangover food, or late-night snack. Honestly, they’re an amazing guilty pleasure any time of day. And you’ll be in good company – the shops serving the best Ćevapi will always have a crowd. 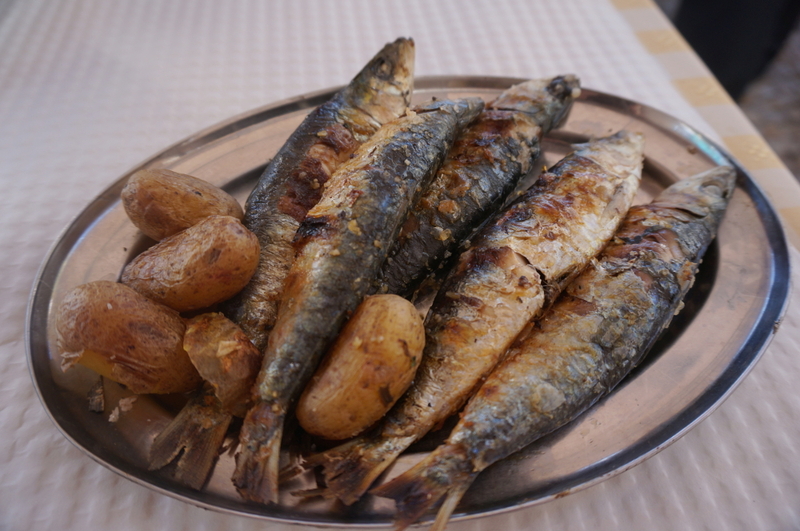 Grilled fish, and particularly sardines, are very popular particularly along the coast. But if you’re thinking of those greasy little fish in a tin, think again! Mediterranean sardines are much larger. A good time to sample sardines in Croatia is during the Festival of St. Lawrence in Split, Croatia. 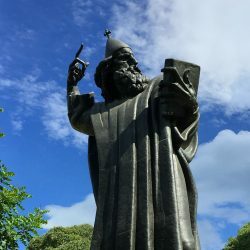 The festival of the Patron Saint of Fisherman happens each August. Beyond the music and games, attendees are invited to sample grilled sardines, along with a little Croatian food and wine to go with it. Every culture has some form of soup, and Croatian cuisine is no exception. One of the most popular soups is a peasant soup or stew called Grah, which literally translates to “bean.” It is typically made with smoked sausage and of course contains a little paprika. Find the full recipe here: Croatian Sausage and Bean Soup – Grah. 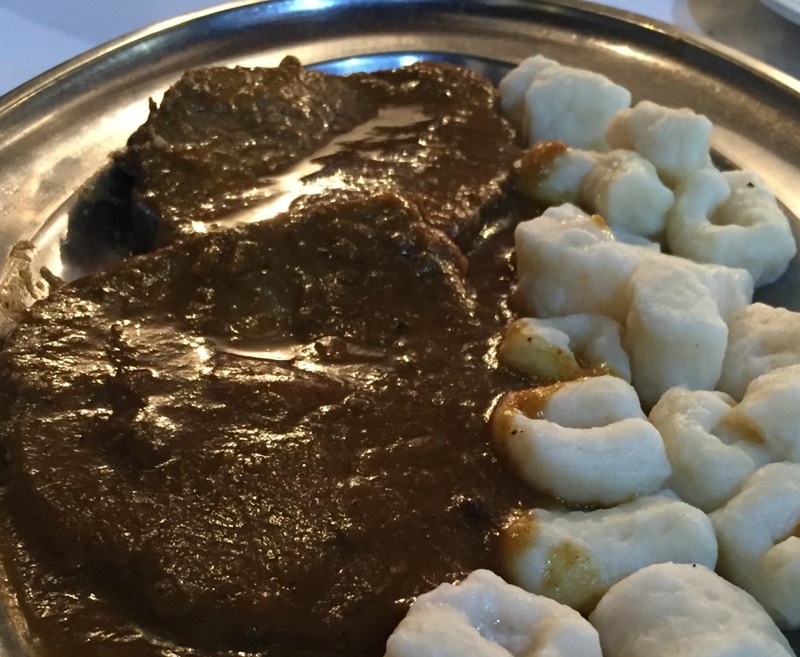 Grilled meats are very popular on Croatian menus. Beyond the Cevapi meat sticks, there are larger seasoned patties (Pijeskavica) or grilled skewers of meat (Raznijic). Most plates come served with some form of potatoes, diced onions, and a red paste (Ajvar) made from red peppers or peppers and eggplant, Croatia’s answer to ketchup. Bluefin tuna is appearing on more and more Croatian menus, even as elsewhere in the world the price of the fish makes it unaffordable. Why? Croatia is one of the few areas in the world that tuna is farmed. Of the coast in the Adriatic Sea. large tuna cages sit where juvenile tuna are fed and grown huge fish.The farming process is controversial, since it’s not “true” farming. Most of the fish are sold to Japan, which consumes over 80% of the world’s bluefin tuna, but plenty is making onto the tables in Croatia. New dishes are being created using tuna, including a unique using tuna rather than beef in paÅ¡ticada. The place to go truffle hunting in Croatia is in the forests of Istria, in the north. In fact, the Guinness Book of World Records names a 1.2 kg truffle found in Istria as the world’s largest truffle. So, you’ll find truffles on all sorts of menus here. Specialty shops are filled truffle products such as shaved truffles, truffle infused oils and pastes. But our favorite way to enjoy them is in a creamy sauce over pasta. Börek (or Burek) is made from a flaky, chewy pastry dough and filled with anything from feta cheese to spinach, meat or even sweet fillings, such as sweetened yogurt. Grab a portion from a vendor and and eat it warm with some good Croatian coffee. 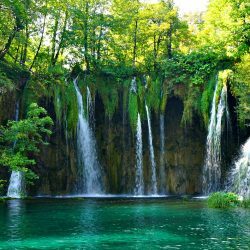 You’ll be in good company – along with their snacks, Croatian’s drink 5.1 kg (11.2 pounds) of coffee per capita annually. Beating out the US by 2 pounds. Most conversations in Croatia are accompanied by a good cup of coffee. Cheese from the island of Pag in the Adriadic Sea is famous. On the island, the dry wind blows the salt from the sea onto the island, and the minerals infuse the few scrubby plants on the island. The sheep have to climb the hills to find the plants, and the lean sheep produce a uniquely flavored milk. Pag cheese is a protected item, but you have to look out when purchasing it – there are many cheeses labeled as “cheese from Pag” which may or may not be made with milk from the Pag sheep. 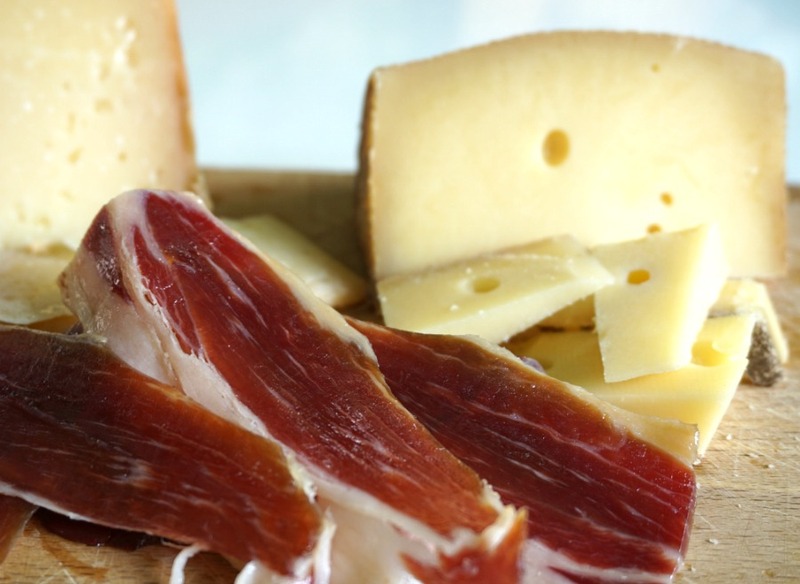 Croatian Prosciutto differs from it’s Italian cousin in one main way. The pork is smoked for 48 days during it’s aging process, so the meat is unique in its smoky flavor. We’ve been writing about Croatian food at this point. 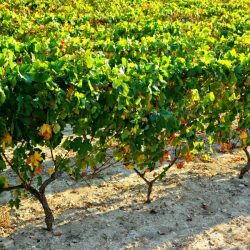 But, Croatia’s history of wine production dates back thousands of years, so you know they’ve figured out how to make good wine. There are dozens (if not hundreds) of varieties of grape, and red, white, and rose wine are popular. It’s nearly impossible to recommend a single wine or varietal, but a few stand out: Zinfandel, Grk, and Grasivina. During times under communist rule wine production suffered: quantity was prized over quality and boutique wine production was discouraged. But boutique wine production has re-emerged and some very good wines can be purchased at very reasonable prices. Wine lovers will not be disappointed in Croatia. The most popular Croatian beers are Ožujsko, Karlovačko and Pan, and you’ll find one (or all) of these on tap at most bars and restaurants. 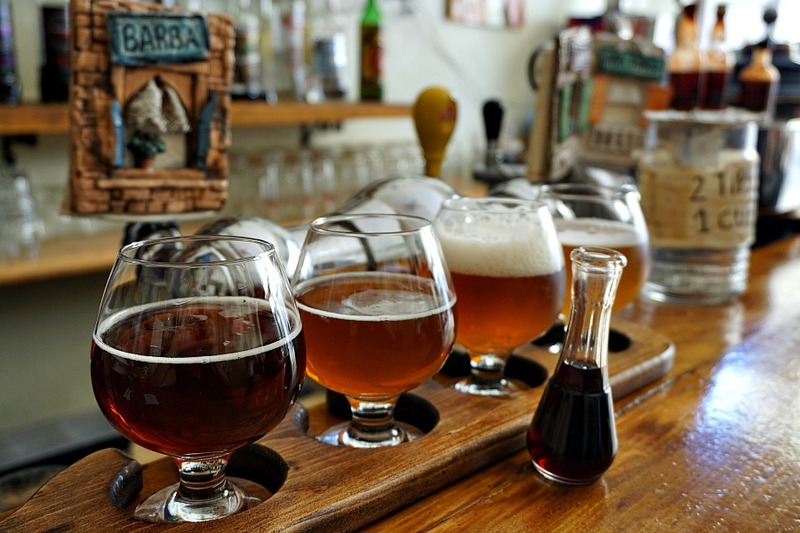 Like most of Europe, craft brews here are growing in popularity, and you can find a good selection in one of the craft beer bars in any of the major cities. Just like most of us, Croatians have a sweet tooth, and fritule is a favorite way to satisfy it. This donut hole sort of treat is traditionally a Christmas recipe, but fritule is sold year round by street vendors. They’ll serve you up a big cup full covered in powdered sugar or drizzled with chocolate. 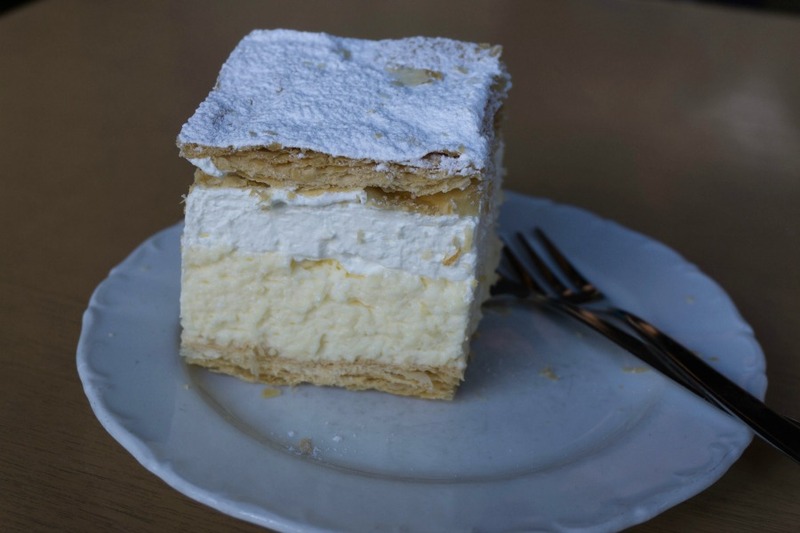 We first became acquainted with cream cake during a visit to Bled Lake in Slovenia. The Croatian version of the cake is Kremsnita. The cake has a layer of white custard and cream all sandwiched together in a flaky crust and covered in powdered sugar. Another good option to enjoy with a cup of coffee. It’s impossible to talk about the cuisine of Croatia and leave out grappa. Whether plain or flavored with walnuts, figs or honey, grappa is a favorite drink in Croatia. Don’t leave without trying a sample after a meal. It’s supposed to help with digestion – or so they say. Whether it does or doesn’t, who cares. 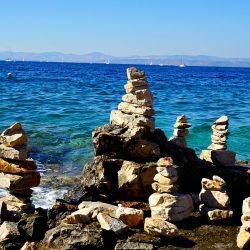 Like all of the food and drink of Croatia, it’s there to enjoy slowly, and most importantly with friends and family. As they say in Croatia when they drink it – “Zivjeli” (cheers) Life is beautiful; let’s live. Great article and amazing pics. Actually i am drooling right now. 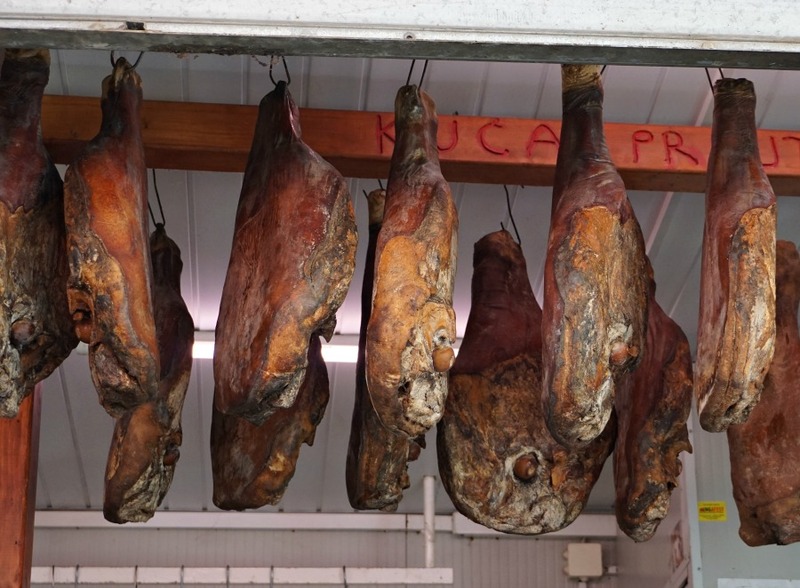 In my next visit will taste the Croatian Prosciutto. Wonderful photos! Croatia is amazing. 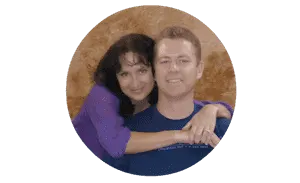 Thanks for sharing such a wonderful post.